This one-day workshop will be held on 9 December 2015 to engage researchers and practitioners with findings from recent research into the perceptions, aspirations and behaviour of refugees from Syria, host community members, and practitioners in Turkey, Lebanon and Jordan. Professor Dawn Chatty will present her British Academy funded research on this theme alongside a number of other researchers and practitioners with recent experience in this area. The workshop aims to promote greater understanding of the unique socio-historical context of the Syrian humanitarian disaster in each of the regional hosting countries by addressing specifically changing perceptions and aspirations. In addition the workshop hopes to present examples of good practice and lessons learned from practitioners in all countries bordering on Syria. The speed with which Syria disintegrated into extreme violence and armed conflict shocked the world and left the humanitarian aid regime in turmoil as agencies struggled to respond to the growing displacement crisis on Syria’s borders. The mass displacement has now reached Northern Mediterranean shores as well as Central European borders. It has left the neighbouring states of Turkey, Lebanon and Jordan in a quandary as to how to effectively provide protection for these people seeking refuge. None have granted the displaced refugee status; each has established temporary measures to deal with this crisis. In many cases the displaced and the host communities have not been consulted and thus tensions have quickly emerged among host communities, displaced Syrians and humanitarian policy-makers and practitioners. That tension, despair and hopelessness has seen thousands leave the region over the past year in search for survival in dignity. This workshop aims to explore the different perceptions and aspirations of Syria’s refugees, humanitarian assistance practitioners, and the host community. It also seeks to probe what social factors with the host community, will, when circumstances permit, positively contribute to the reshaping and re-integration of Syrian society post-conflict. The 6.45 million displaced people inside Syria make this the largest IDP crisis in the world, with possibly also the largest number of people who are ‘trapped’. In addition, the number of refugees from Syria continues to increase. The international community has an opportunity to set up, from now, an effective response to what will clearly become protracted displacement. The authors of the 20 articles in this latest issue of FMR offer observations that could be of value in increasing the level of protection for the displaced and in shaping assistance to both the displaced and the countries and communities that are ‘hosting’ them. The full list of contents, with web links, is given at the end of this page. 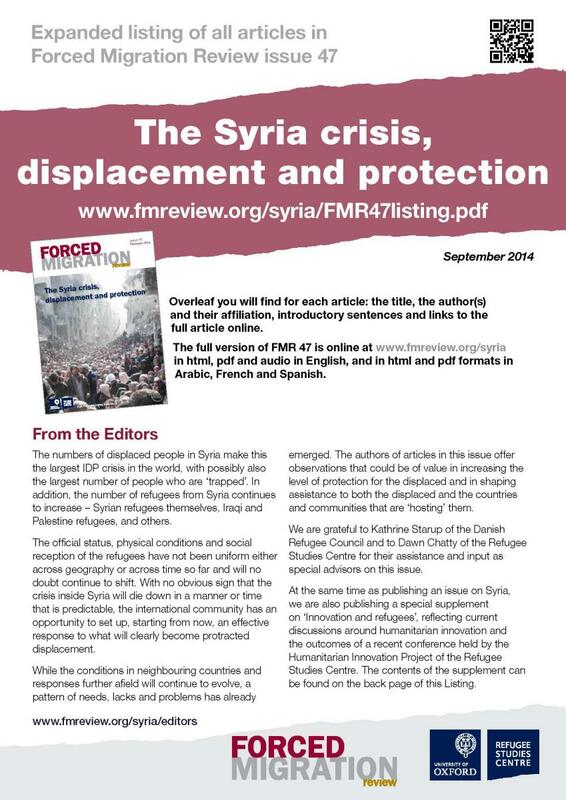 FMR 47 will be available online and in print in English, Arabic, French and Spanish. Requesting copies: If you do not regularly receive a print copy of FMR and would like to receive a print copy of FMR 47 or the Listing for your organisation, or multiple copies for onward distribution or for use in training or at conferences, please contact us as soon as possible at fmr@qeh.ox.ac.uk. Please state how many copies you need (of full issue and/or Listing) in which languages, and provide a full postal address. Please help disseminate this issue as widely as possible by circulating to networks, posting links, blogging, mentioning it on Twitter and Facebook and adding it to resources lists. 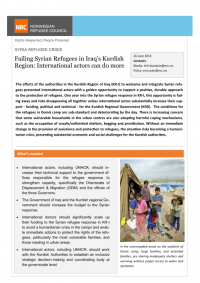 This issue has been published with the assistance of the Regional Development and Protection Programme, a three-year regional initiative for Lebanon, Jordan and Iraq, led by Denmark and with contributions from the EU, Denmark, Ireland, the Netherlands, UK and the Czech Republic. Thursday 24 October 2013, 7pm to 8.30pm. Doors open 6.30pm. How do we disentangle ‘news’ from media reports which are framed in terms of one or other of the competing ‘narratives’ about what’s happening in the Middle East? How do we decide whether the Syrian regime, the rebels or the Americans can be believed? Whose ‘narrative’ is the more compelling – the Israeli one or the Palestinian one, if we are to understand what drives their conflict? Time was, we did not even talk in terms of ‘narratives’ at all. But since the 1990s it has become common parlance. Academics use the term to describe the mental maps that we all absorb as we grow up (from history lessons, literature, politics and family stories) that frame our understanding of who we are and our place in the world. Politicians talk about competing with each other and the media to ‘frame the national narrative’ so that it reinforces their view of the world and serves their interests. We invite you to come and discuss what’s at stake in understanding the contemporary Middle East. Rosemary Hollis – Professor of Middle East Policy Studies and Director of the Olive Tree Programme, City University London. Her book on Britain and the Middle East in the 9/11 Era was published in 2010, RIIA and Wiley Blackwell. Dr James Rodgers – Academic (City University London) and journalist. During his BBC career (1995-2010), his postings included Moscow, Brussels, and Gaza where, from 2002-04, he was the only international journalist based in the territory. He is the author of No Road Home: Fighting for Land and Faith in Gaza (Abramis, 2013), and Reporting Conflict (Palgrave Macmillan, 2012). Yoav Galai – Olive Tree scholar at City University London (2008-11) and prior to that Jerusalem-based photojournalist. See Also: United Nations News Centre Press Release and also an Independent Press Story. This paper considers the role innovation can play in making humanitarian action more sustainable and efficient while reducing dependency. Many organisations have begun to examine how innovation can help them deliver better services. However, this ‘top-down’ focus on organisational improvement, while vital, neglects the possibilities of ‘bottom-up’ innovation: the ways in which beneficiary populations can use their own talents and skills to foster self-reliance and long term solutions to their situations. The paper draws on innovation theory, design theory and participatory development approaches to build a research framework for examining this kind of innovation. Rather than viewing beneficiary populations solely as recipients of aid, the authors see them as actors with agency who can use their aspirations, skills and community resources to help craft sustainable and appropriate humanitarian solutions. 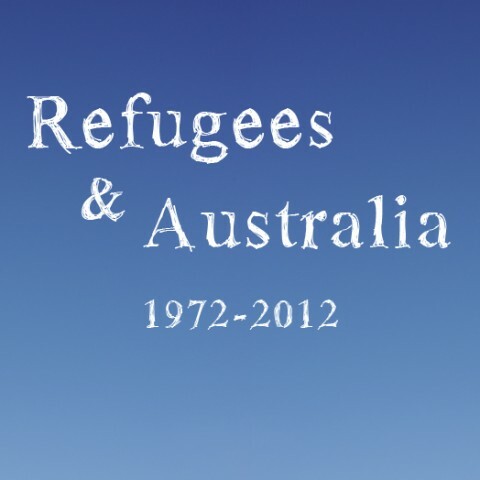 The authors are both part of the Humanitarian Innovation Project at the Refugee Studies Centre, where Dr Betts is Director and Ms Bloom is a Research Officer. Find out more about the Project at http://www.oxhip.org/. This paper addresses the dearth of academic research into humanitarian responses by actors of the global South. It challenges the deeply-held assumption among both academics and practitioners that humanitarianism is chiefly a product of Enlightenment thinking and the nineteenth century missionary activity of Western religious groups. There is a great deal of academic literature on responses to humanitarian crises by institutions and actors of the global North. However, there is comparatively little on those responses by the global South, and in particular almost none on Southern responses to crises of forced displacement. The paper argues in favour of a more nuanced conceptualisation of humanitarianisms, calling for more academic study of the various humanitarianisms of the South, and encouraging academics and practitioners to critically engage with the many different solidarities which can drive humanitarian action. It cites specific examples of South-South humanitarian responses to forced displacement in Asia, Latin America, Africa and the Middle East, including those of faith-based humanitarianism. – See also other materials related to this project. – Special exhibit that runs until 12 May 2014 at the Migration Museum in Adelaide, Australia.